If you have a big problem of addiction to your smartphone, to spend all your time playing games, you should definitely know Cut The Rope game. Yes for once we will not talk about the famous Angry Birds, but rather of another best seller of its kind. The goal is very simple, There is a little monster inside the game, has only one request…CANDY! Help get the candy to Om Nom, the lovable star of the game, in this highly innovative and addictive puzzle game. 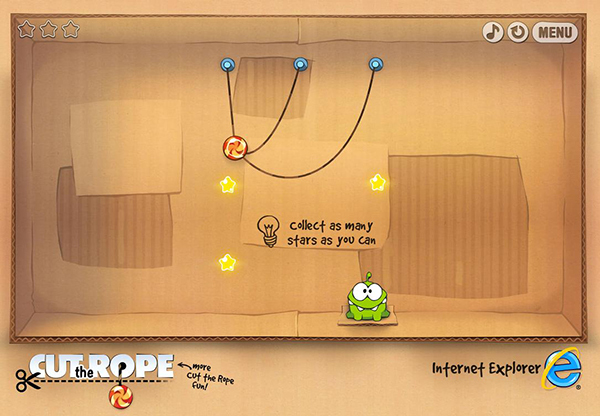 Combining outstanding physics, devilishly tricky levels, and bright colorful High Definition visuals, Cut the Rope is one of the most original and fun-filled games on your browser now. As said, this may seem very simple, but after all the 1st level, you will see that this is far from being the case. The problem as a game like Cut The Rope is that it quickly becomes addicted ! You’ve never tried? Well exactly, you will be able to play now and what, in your browser, any browser ! Yes, finally the last or at least those browsers who can properly interpret the HTML 5 for this game was made ​​entirely in HTML 5 . So basically Chrome , Firefox , Safari but also Internet Explorer version 9. And as a port of the browser game was made ​​to promote IE9, know that if you use it, you will receive 9 bonus levels! In short, now you have no reason to miss out on CTR that I urge you to try urgently ! The free game includes 27 levels, and you can play it right now simply by pointing your browser to the following link.